Is it Possible to Write Clearly and Simply? How Can Writers Know if They Have Achieved Clarity and Simplicity? Is it Possible to Write "Clearly and Simply"? The task of writing clearly and simply has never been either clear or simple. In fact, it can be one of the most difficult of all writing tasks. Clear and simple writing is an art to which many aspire and few achieve. Even so, the understandability of web content depends upon clear and simple writing. Unclear or confusing writing is an accessibility barrier to all readers, but can be especially difficult for people with reading disorders or cognitive disabilities. Language and cultural differences matter. To complicate matters, the "rules" of clear and simple writing in English may not apply at all in other languages, or even between cultures that speak the same language. Many English-speaking countries value directness and explicitness in written communication. Other cultures feel that this style is too blunt, and perhaps even insulting to readers. Despite the difficulties in defining the meaning of "clear and simple" writing, the suggestions in this section may still benefit writers of web content. The suggestions serve as general guidelines for writing clear and simple English, primarily from an American English perspective. Those who write in other languages should seek resources that apply specifically to those languages. Cognitive abilities matter. Not everyone reads at the same level or has the ability to understand text content, even when presented clearly and simply. Reading disorders, memory disorders, attention deficit disorders, and other conditions which affect the brain's cognitive processes can compromise a person's ability to benefit from text. The guidelines presented below will improve readability for many people, but not for all. The guidelines presented here are not a complete list, nor do they apply to every situation, but they are a good starting point. Writers who take these guidelines seriously are more likely to write clearly and simply. This may be the most important guideline of all. You have to think clearly about a topic in order to communicate it clearly. The organization process is ongoing, starting before any words are written and continuing throughout the entire process. There is nothing wrong with reorganizing a paper as you write it. When you think you're finished, take the opportunity to analyze it one more time to see if the organization still makes sense to you. If it does, great! If not, try again! "If any man wishes to write in a clear style, let him first be clear in his thoughts." "Writing comes more easily if you have something to say." The formula to follow is to begin with an introduction, or overview of the paper's ideas, explain the ideas in the main body of the text, then summarize or review the ideas at the end. Not everyone appreciates baldness as they should. There are advantages to being bald. Main idea 1: Bald people don't have to worry about the cost of haircuts. They can cut their own hair (what remains of it) with a razor or clippers. Main idea 2: Bald people don't have to style their hair. They only have to dry their head with a towel after showering, and are then free to move on to other more relevant activities, like reading the comics, practicing yoga, or climbing trees. Main idea 3: Even on windy days, bald people never get hair in their eyes or mouth, at least not their own hair, which makes windy days more bearable for the vast majority of people who don't particularly like the taste of hair. Baldness allows for some under-appreciated conveniences in life, in terms of haircuts, styling, and windy days. You ought to consider being bald. The more you stray from your main point, the less likely people will be to remember it. Capture the attention of your readers by including relevant details that motivate them to continue reading. "What we want is a story that starts with an earthquake and builds to a climax." You should write differently for a classroom of first-graders than you would for a committee of post-graduate scholars. In addition, you should take into account people's areas of expertise, even if they have the same level of education or intelligence. Cultural and gender differences can also play a role in defining a target audience. As you write, keep your audience's characteristics in mind and write accordingly. The amount of explaining you need to do depends upon how familiar your audience is with the topic. Explaining concepts is not insulting; it is helpful, as long as the explanations show that you respect the reader. Some people with cognitive disabilities may need more explanation than others, but when you write for general audiences, assume a general level of intelligence. Some experts say writers should aim for "eighth grade level" writing. It is difficult to determine for sure what this means. Many popular magazines, such as Readers Digest and Ladies' Home Journal are written at about this level. News sources such as Newsweek are written at a slightly higher level, approximately 10th grade. All of the ideas in a paragraph should relate back to the main point. If possible, put the main idea of the paragraph in the first sentence. The following paragraph presents an idea about teams. The first sentence clearly states the main idea of the paragraph ("Obstacles are a continual fact of life for teams"). As you read this paragraph, notice how the other sentences in the paragraph support the main idea in the first sentence. Obstacles are a continual fact of life for teams. They occur from the moment a potential team gathers until the team comes to an end. Obstacles also differ as much as the teams, performance challenges, organizational settings, and business contexts that produce them. The Burlington Northern Intermodal Team, for example, encountered weak support from management, policies against advertising, distrust of truckers, and mediocre talent in the intermodal department. It also faced bad weather, intense competition, and a poor economy when it had to prove its strategy with the two new hubs. Any of these obstacles could have derailed the team's progress and performance. None of them did. Indeed, working through the obstacles made the team stronger. Some software companies issue crippleware demos. Others issue shareware or nagware. Still others issue nothing but vaporware. The words "crippleware," "demos," "shareware," "nagware," and "vaporware," are familiar to many people in the computer industry, but mean little or nothing to people unfamiliar with the terms. The above sentence accurately describes one aspect of the social movement known as critical theory, but it uses terms that are somewhat less common outside of critical theory, and which have specific meanings within the theoretical perspective. The example sentence may confuse people who are unfamiliar with critical theory. Writers should strive to communicate with their readers, not impress readers by using uncommon or showy words. The populous legion of impecunious vagrants congregated near the basilica. The large crowd of poor homeless people gathered near the old church. Passive voice weakens the action of a sentence by distancing the action from the subjects performing the action. Active voice links the subjects directly with the action. The food was eaten at the party by the guests. The result of building a highway through the farmland was increased profit-seeking by some property owners and the eventual loss of land adjacent to the highway to contractors' commercial and residential construction projects. The guests ate the food at the party. We all had a good time. OR We all enjoyed ourselves. Building a highway through the farmland caused some property owners to seek profits by selling their land to contractors who eventually constructed commercial and residential projects on the land adjacent to the highway. Writers often use the verb "to be" (is, are, was, were) when more active verbs may be more appropriate. Over-use of the verb "to be" often forces writers to use the passive voice more than necessary. The verb "to be" suggests passivity because it connects two entities that are essentially equal. The phrase "A is B" essentially means "A equals B." The relationship between A and B is static. In contrast, other verbs—such as "to improve," "to clarify," "to modify," or "to destroy"—imply more of a dynamic relationship between A and B. One way to improve your writing is to use strong verbs. The equal relationship between the two parts of the sentence implies no action. Using stronger verbs can improve your writing. The subject of the sentence ("using stronger verbs") performs the action of improving the object of the sentence ("your writing"). Make sure that the sentence construction is consistent within itself. His new sorting machine saves time, increases profitability, and worker satisfaction. His new sorting machine saves time, increases profitability, and increases worker satisfaction. His new sorting machine saves time. His new sorting machine increases profitability. His new sorting machine worker satisfaction. The third sentence in this example obviously needs a verb to make the sentence complete and parallel with the previous sentences. Emphasize the way things are, were, will be, or would be. To the extent possible, avoid the use of don't, didn't, and other words that structure a sentence from the perspective of the way things are not, were not, will not be, or would not be. Don't forget to water the flowers. I didn't remember where I was last night. Choir members are not supposed to sing in ways that don't blend with the rest of the choir. Remember to water the flowers. I forgot where I was last night. Choir members are supposed to sing in ways that blend with the rest of the choir. Direct instructions can increase comprehension and place more of a sense of responsibility on the reader. Students should read chapter five. It is best to eat a healthy breakfast before leaving the house in the morning. It can be dangerous to attempt to walk on a tightrope stretched over a pit of hungry crocodiles, so this practice is highly discouraged. Eat a healthy breakfast before leaving the house in the morning. Don't walk on a tightrope over a pit of hungry crocodiles . Most readers find double negatives, or multiple negatives, a bit awkward, which can lead to confusion, or at least to slower comprehension. Don't forget to not open your mouth when you fall in a muddy puddle. I don't let them not help with the chores. Don't open your mouth when you fall in a muddy puddle. Keep your mouth closed when you fall in a muddy puddle. I don't let them avoid the chores. I make sure they help with the chores. Unfamiliar acronyms and abbreviations mean nothing to readers. Expanding acronyms and abbreviations allows readers to learn their meaning. This is especially true the first time, or the first few times, an acronym or abbreviation is used. The teacher had to prepare an IEP for the children with LD and had to comply with the NCLB regs in order to meet AYP reqs. The teacher had to prepare an Individualized Education Plan (IEP) for the children with learning disabilities (LD), and had to comply with the regulations of the No Child Left Behind (NCLB) Act in order to meet the Annual Yearly Progress (AYP) requirements. Use an automated spell checker, but also proof-read the document for correctly spelled words that are used incorrectly. I wanted to see hte sunset for myself. Our products an services are the best ones fore the price. Readers tend to lose the main point of long, run-on sentences. Help readers stay focused by creating shorter sentences. "Good things, when short, are twice as good." We all agreed that we ought to eat at the new Greek restaurant in town, then see a movie, and, before going home, we should stop at the grocery store to buy milk for breakfast, because we ran out of milk earlier in the day and cold cereal doesn't taste good without milk, especially not with orange juice, which gives cereal a tart, citrus flavor which is fine for drinking from a glass, but not so fine for eating with flakes of cereal. Sentence 1: We all agreed that we ought to eat at the new Greek restaurant in town, then see a movie. Sentence 2: Before going home, we should stop at the grocery store to buy milk for breakfast because we ran out of milk earlier in the day. Sentence 3: Cold cereal doesn't taste good without milk, especially not with orange juice. Sentence 4: Orange juice gives cereal a tart, citrus flavor which is fine for drinking from a glass, but not so fine for eating with flakes of cereal. It is my opinion that the explanation that was given by the teacher was delivered in a way that was not brief enough to be interesting, and was not understood by the class. I think that the class misunderstood the teacher's long, uninteresting explanation. The class misunderstood the teacher's long, uninteresting explanation. Say only what you need to say. Supplement the text with illustrations. The most drastic—and perhaps the most useful—solution for these audiences is to provide illustrations as alternatives to the text, or at least as enhancements of the textual content. In other words, do everything possible to clarify and simplify the text, then go one step further by supplementing the text with illustrations. Reduce text to a bare minimum. Pages with a large amount of text can intimidate users with reading difficulties. For this audience, the less you say, the better. Be as literal as possible. Some people with cognitive disabilities have a hard time distinguishing between the literal meaning of ideas and implied meaning. Sarcasm and parody can be especially confusing for some people. Strictly speaking, writers cannot know for sure whether their writing is truly "clear and simple." No matter how well writers think they have explained a concept, some of the readers will almost always misunderstand. 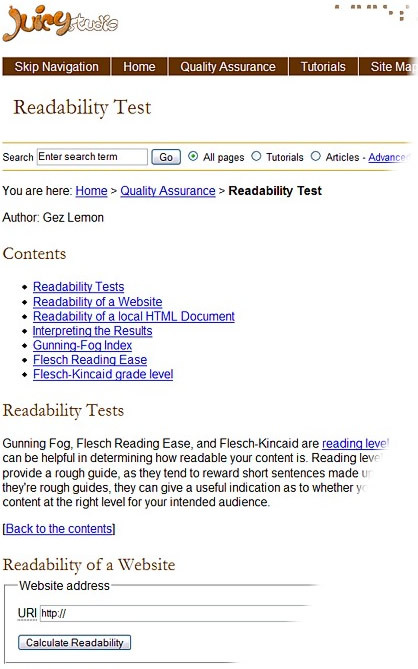 Algorithms, such as the Gunning Fog Index, Flesch Reading Ease Index, and Flesch-Kincaid Index attempt to evaluate the readability or reading level of text content. Such algorithms appeal to some experts because they are based on clear-cut mathematical formulas. The tests produce measurable results. Unfortunately, the tests' emphasis on quantitative (numerical) accuracy can mislead writers into thinking that achieving clear and simple writing is a well-defined, formulaic process, when it is not. The algorithms themselves are somewhat questionable too, since they use such superficial criteria as the number of syllables, the number of words, the length of sentences, etc, all of which are indirect measures of readability, at best. 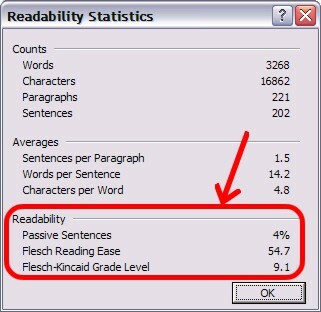 Users of Microsoft Word can evaluate written content against the Flesch Reading Ease scale and the Flesch-Kincaid Grade Level scale within the word processor itself. Word also provides a percentage count of passive sentences (the lower the percentage the better). To activate this feature in Word, go to the Tools menu, click Options, then click on the Spelling & Grammar tab. Select the Check grammar with spelling check box and the Show readability statistics check box, and then click OK. To use the feature, go to Tools > Spelling & Grammar and let Word run through the document for spelling and grammar errors. At the end of this process, a dialogue box will pop up showing the readability score. Readability Calculations by Micro Power and Light Co.
Also, an online readability test using the Fog index is available from Juicy Studios. Although readability tests are only a superficial measure of true readability, they can at least provide some basic feedback and give authors a general idea of how readable their documents are. It is not easy to write clearly and simply, but it is important to try. Users are more likely to understand your writing if you take the time to organize your thoughts and write them in the clearest, simplest form possible, taking into account your audience. To maximize understandability for people with cognitive disabilities, limit the text, add appropriate illustrations, and avoid indirect or implied meanings (such as sarcasm or parody). In the end, nearly everyone benefits from clarity and simplicity.